NAVY undersuit is intended for divers swimming in very cold waters, using laminated dry suits. The material was produced on special order from the U.S. Army Special Forces Divers, in order to meet all the required parameters for long-diving in cold waters. Thermally, the NAVY Body Warmer is equivalent to traditional warmers based on Thinsulate weighing about 400 g / m. However, NAVY has many advantages, about which users of such conventional warmers can only dream of. The primary advantage of the NAVY is its flexibility. This is not a medieval knight armor with which thick warmers are associated with. It is very light, weighing less than 1.5 kg. Compared to conventional warmers, allows a reduction of at least 2 kg of lead. Maintains great thermal comfort, even after drenching. Dries in a few hours (after complete flooding or washing). There is no limit to number of washes, it can be spin-dried. It is soft and pleasant to the touch. It does not scratch or irritate the skin. "NAVY has exceeded the wildest expectations. Tested in difficult conditions with a wet suit, i.e. after complete water drenching during the previous dive. Very good thermal comfort." "NAVY is the best and the most comfortable warmer all of all which I used over 10 years of diving in dry suits." "Very flexible, provides unique comfort of motion in my dry suit. While I was putting it on I thought: why spend 800 PLN if I have a different warmer? 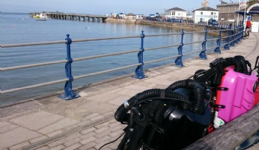 After the dive, I knew that without a doubt it is worth a purchase." "Very comfortable, I felt nothing after drenching. Only after leaving the water I noticed that the warmer is wet. Superb!" "Excellent thermal comfort. Thanks to good adhesion to the body, the warmer makes the air came precisely and quickly into any place under the suit. Long stay on the surface before immersion does not cause problems with sweating and the accumulation of water on the body (outside temperature of 21 degrees Celsius)." "Does not restrict movements, about 2 kg of ballast less. Compared with the previous traditional warmer much, much better." "Thanks to good adhesion, thermal bridges do not occur. Very warm." © Copyright Shawtek Diving All rights reserved.